Over the decade of HAVEN’s operations, what have been your biggest learnings? Arthur: Back in 2006, we were just a two-man operation: my brother Daniel and myself. We didn’t know how the industry worked and were very naïve about what it would take to open our own retail store. Learning the intricacies of the industry, how to work with brands, travelling, getting financing, starting an ecommerce business, expanding our business, and staying focused have all been tremendous learning experiences for us. We’re still independent. We are continuously learning and evolving our business to push new directions. The market is constantly changing and we know how important it is to adapt and take advantage of those changes. Daniel: The biggest thing I’ve learned is to trust the people we’ve brought into the company. In giving them the structure and the tools to succeed, our team never stops surprising and impressing us. That, and to not be afraid to constantly try new things and make mistakes. As long as you learn something and keep moving forward, you’ll be OK.
You’re currently preparing an in-house label. What are the biggest challenges you’ve faced? Arthur: Keeping our focus and constantly rediscovering who we are as HAVEN is a continuous challenge. We are always focused on being a great retailer and over the years seeing customers’ enthusiasm towards our stores, we realized we have created something special, something much more than just a store: we have an incredible brand. HAVEN has always been about representing the best brands in the world, and over the years we developed aspirations of creating something of our own with our unique point of view that can sit alongside those brands. Quality is one of our top concerns so finding the right partners that could meet our high expectations was a big challenge. Once we found the right people, it was as though we found the final piece to the puzzle. Now, we are working with some of the best manufacturers in the world, both in Japan and Canada, who ensure we are only making products that meets our standards. What are your thoughts on the current state of the fashion industry? Specifically, what are your thoughts on the state of streetwear? We were influenced heavily by the Japanese retail model that regularly ignores categorization and freely combines high fashion with streetwear. We have always curated the brands we carry based primarily on their quality and authenticity instead of hype or trends..
Daniel: To be honest, there isn’t much that excites me in streetwear right now. I’m a product guy and manufacturing quality and substance matter more to me than what is contemporary and trendsetting. From what I’ve seen, many newer brands lack the resolve to create quality products. With our brand, I feel as though we’ve tapped into most of the brands that resonate with us: brands who value craftsmanship and maintain standards in quality control. The next logical step was to start our own. Arthur: I think we will continue to see more retailers and brands going direct-to-market; it’s the natural evolution of the marketplace. Wholesale will no longer exist in the traditional sense. I believe it will work more like a partnership in the future. Daniel: Similarly, I believe that brands will continue to move away from the traditional retail model and go direct-to-consumer. Strong partnerships matter more than ever before. Retail spaces are bound to transform into something more experiential and engaging. It’s important, as a retailer, to stay agile and adaptable at this time. Daniel: It’s been a great year for us and I really have to thank the whole team for that. We’ve been fortunate to have several highlights this year. The opening of our new retail flagship in Toronto has really raised the bar for what we’re able to execute in brick and mortar retail. The design and build quality of that shop is incredible and we hope that the community in Toronto continues to grow and support us. Our media voice, intelligence magazine, is growing in new and interesting ways that I didn’t see coming and we’ve been able to use our relationships and network in creating a great global platform for designers, brands and artists. Lastly, the launch of the HAVEN in-house brand is something we’ve been working on for a long time and it’s incredibly satisfying to see it come to fruition and equally exciting to see how the public responds to it and where it will go in the future. Do you have short- and long-term goals for your brand, as well as any personal goals? 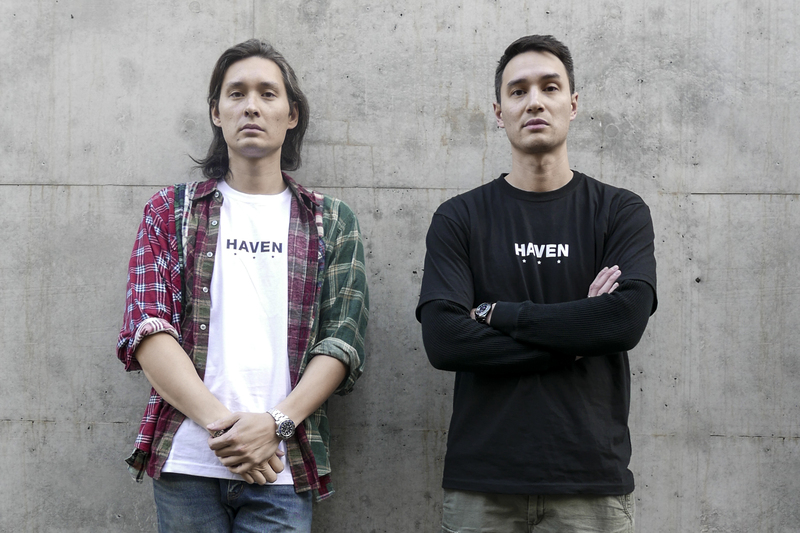 Arthur: In the short term, we’d like to keep pushing forward, breaking new ground with the HAVEN brand and continuing to work with like-minded individuals to elevate our perspective. We have special projects and collaborations in the works that we’re excited to unveil in the coming seasons. We are constantly evolving our ecommerce experience and we are in the process of developing a unique ecosystem and user experience for HAVEN and intelligence. In the long term, we’d like to open HAVEN stores in other major markets outside of Canada and continue to grow our global presence. Personally, we’d like to continue to travel, experience new things, learn, and be inspired by places and people around us. We’re very lucky that we get to do what we do for a living. Daniel: Our long-term goal for the brand is to provide our customers with the best value for their money and to build and deliver the highest quality apparel at the best price. The brand is still in its infancy, so there’s a lot of growth ahead of us, but we are hard at work expanding the range and introducing exciting projects and collaborations. I’m fortunate to work with especially talented artists and designers, but also with the HAVEN team on a daily basis. The team’s loyalty and excitement for what we do is always impressive to me. If I can continue to be in that environment, I will always be fulfilled. That, and I’d love to learn to play a musical instrument—the piano, perhaps? I’m always up for a challenge.